BEIRUT Lebanese soldiers in armored vehicles fanned out across the country on Monday to break down civilian roadblocks and chase gunmen off the streets as tempers flared over the killing of a top intelligence official who was a powerful opponent of Syrian involvement in Lebanon. Sectarian clashes killed at least five people. A sixth person was killed after soldiers returned fire following an attack on their patrol. The killing of Brig. Gen. Wissam al-Hassan in a Beirut car bomb on Friday sparked days of tensions, accusations and violence in Lebanon between supporters of Syrian President Bashar Assad and his opponents. Al-Hassan was solidly in the latter group, and his supporters, many of them Sunni Muslims, blamed Damascus for the killing. Many also called for the resignation of the Hezbollah-dominated government, saying it is too cozy with the Syrian regime. In Washington, the FBI confirmed to CBS News its personnel was heading to Beirut to assist Lebanese officials in investigating al-Hassan's death. The State Department said it was worried about the violence in Lebanon. "We've been clear for some time about the possible spillover effect from the conflict in Syria," State Department spokesman Mark Toner said Monday. 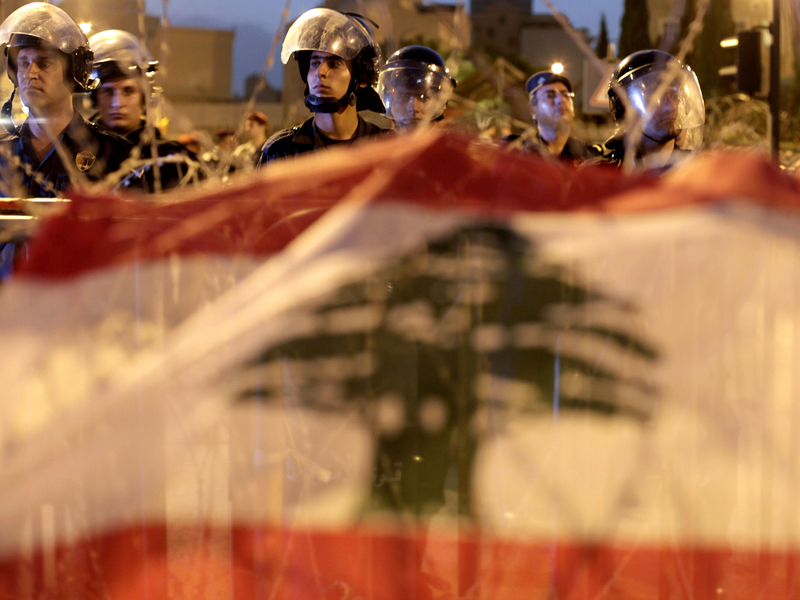 The Lebanese army's security operation Monday sought to sweep from the streets gunmen who many here fear could end up dragging the country into the kind of sectarian clashes that have plagued Lebanon for decades. "The nation is passing through a crucial and critical period and tension has risen in some areas to unprecedented levels," the army said in a statement. It urged politicians to be careful not to incite violence "because the fate of the nation is on the edge." "Security is a red line," the statement said, adding that strict measures are being taken to "prevent Lebanon from being an arena for settling regional problems." Cracks of gunfire rang out in Beirut as soldiers took up positions on major thoroughfares and dismantled roadblocks of burning tires erected by angry youth. The state news agency reported sporadic gunfire in parts of Beirut and around the northern city of Tripoli. Tripoli saw clashes between two neighborhoods that support opposite sides in Syria's conflict and have a decades-long history of violence. Four people were killed in the fighting between the Sunni neighborhood of Bab Tabbaneh, which supports Syria's rebels, and the adjacent Alawite neighborhood of Jabal Mohsen, which supports Assad. Security officials said one man was killed in the Wadi Zayneh area south of Beirut. The state news agency said a Palestinian man was killed in Beirut's Qusqus neighborhood when army troops returned fired on their patrol. More than two dozen people were wounded nationwide. Lebanon and Syria share similar sectarian divides that have fed tensions in both countries. Most of Lebanon's Sunnis have backed Syria's mainly Sunni rebels, while Lebanese Shiites tend to back Assad, who belongs to the minority Alawite sect  an offshoot of Shiite Islam. Tripoli residents said scores of soldiers fanned out across the city in an attempt to restore calm. The military also set up checkpoints, searched cars and checked people's identity cards. Al-Hassan, the assassinated intelligence official, was a Sunni who challenged Syria and its powerful Lebanese ally, the Shiite militant group Hezbollah. Many politicians blamed Syria for the killing, and angry protesters tried to storm the government palace after al-Hassan's funeral on Sunday, venting their rage at leaders they consider puppets of the Syrian regime. But they were pushed back by troops who fired their guns in the air and filled the street with tear gas. Prime Minister Mikati, a Sunni, told As-Safir newspaper that when he took up his post last year, he intended to protect all Lebanese, particularly Sunnis. "I was convinced that through this mission, I am protecting my country, my people and especially fellow members of my sect," he said. The prime minister of Lebanon is usually a Sunni according to a sectarian division of top posts in the state. Traditionally, Lebanon's president is Maronite Christian, and the speaker of parliament is Shiite. Over the past year, pro-Syrian Hezbollah and its allies have come to dominate the government. On Sunday night, a group of anti-Syrian protesters started an open-ended sit-in outside Mikati's house in his hometown of Tripoli. The protesters said they will only end the sit-in when Mikati resigns. The ambassadors of Britain, the U.S., Russia, China and France and the U.N. Special Coordinator for Lebanon met President Michel Suleiman to express support for him. "The permanent members at the United Nations call upon all the parties in Lebanon to preserve stability," Derek Plumbly, the U.N. representative. "We strongly condemn any attempt to shake Lebanon's stability." Early Monday, an Associated Press photographer saw dozens of gunmen roaming the streets in Beirut's predominantly Sunni Tariq Jadideh neighborhood, where fighting has taken place. Local Sunni leaders were trying to convince the gunmen to go home. In some roads around Tariq Jadideh, masked Sunni gunmen set up checkpoints, stopping cars and asking people about their destination and where they were coming from. A woman who lives in the neighborhood said the fighting began shortly after midnight and lasted until sunrise. "We couldn't sleep because of the shooting. There were also some booms," she said, referring to rocket-propelled grenades. She asked that her name not be used for fear of reprisals.